FILE - A guest looks at the Touch Bar on a MacBook computer shown in a demo room following the announcement of new products at Apple headquarters, in Cupertino, California, Oct. 27, 2016. Apple is launching a new program designed to address the technology industry's scarcity of women in executive and computer programming jobs. Under the initiative announced Monday, female entrepreneurs and programmers will attend two-week tutorial sessions at the company's Cupertino, California, headquarters. The camps will be held every three months beginning in January. For each round, Apple will accept up to 20 app makers founded or led by a woman. The app maker must have at least one female programmer in its ranks to qualify. Apple will cover travel expenses for up to three workers from each accepted company. 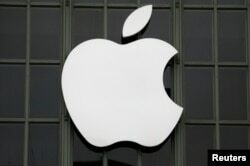 FILE - The Apple logo is shown outside the company's Worldwide Developers Conference in San Francisco, California, June 13, 2016. Like other major tech companies, Apple has been trying to lessen its dependence on men in high-paying programming jobs. Women filled just 23 percent of Apple's technology jobs in 2017, according to the company's latest breakdown. That's only a slight improvement from 20 percent in 2014, despite the company's pledge to diversify its workforce. The idea behind the new camp is to keep women interested and immersed in the field, said Esther Hare, Apple's senior director of world developer marketing. Apple's training camp is "a great step forward," said Lorraine Hariton, CEO of Catalyst, a group that fights for equal rights for women workers. "There a lot of talented women in technology. Hopefully, this helps set a tone for the entire industry." But it's not clear how much of a dent Apple's new program will make. Google also offers training for girls and women pursuing careers in technology, but its program hasn't done much to diversify the workforce so far. Women were hired for nearly 25 percent of Google's technology jobs in 2017, up from nearly 21 percent in 2014, according to the company. FILE- Apple CEO Tim Cook discusses the new Apple iPhones and other products at the Steve Jobs Theater during an event to announce new products in Cupertino, California, Sept. 12, 2018. Apple and other technology companies maintain that one of the main reasons so many men are on their payrolls is that women traditionally haven't specialized in the mathematical and science curriculum needed to program. But industry critics have accused the technology companies of discriminating against women through a male-dominated hierarchy that has ruled the industry for decades. 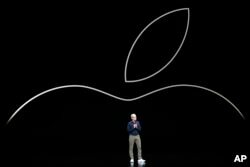 Apple isn't saying how much it is spending on the initiative, though beyond travel expenses, the company will be relying on its current employees to lead the sessions.